Large-scale, vibrant murals are captivating signage solutions for businesses of all industries and backgrounds. Inside, outside, from floor to ceiling or covering a corner, wall mural designs are crafted to meet your branding needs. And with the vast number of competitive businesses typically located in a central area, separating yourself and standing out from everyone else is a number one priority. Why is there such an emphatic importance surrounding the customization and display of wall murals? To start, they’re extremely visible. “Vivid” and “bold” are two words we embrace at SpeedPro Imaging to knock our large-format graphics out of the park. Branded office decorations have a way of motivating employees and keeping them productive and focused throughout the workday. Additionally, they help with the interior design of offices — especially those with open floor plans. Utilizing a piece of signage that has multiple beneficial aspects is one of the best and easiest ways to increase your business success. At SpeedPro Imaging, we believe wall murals are important for three main reasons: They attract customers, express your business’s brand and aid in the visualization of work culture and values for both employees and visitors. Read on for some industry statistics about corporate wall murals and other wide-format signage, the best methods for increasing your brand awareness, the benefits and advantages of company culture and some case studies showing other business’s success stories. In a research survey performed by the University of Cincinnati, households all around North America were questioned about the signage that encourages them into stores as well as what influenced their initial impressions. Lead researcher and analyst James J. Kellaris confirmed television as the number one source for new information, with indoor signage tying with magazine ads as the second most persuasive source. And right behind, in third place — outdoor signage. This fact places hard-to-dispute importance on the effects of office decorations both inside and out. Even in a dominating technological and internet-focused age, visual displays are still prevailing over the intense onslaught of online media advertising. In a study published by the Sign Research Foundation, 60 percent of businesses increased their sales by an average of 10 percent after installing new large-scale pictures and wall murals around their office buildings. Adding new signage doesn’t only create a new visual for visitors and customers to look at — it also engages and communicates with them as well as reshapes and enhances their perception of your brand. This last point about changing a customer’s perception is crucial in the success of your signage and, as a result, your business. Another study by the same group found evidence showing that more than one-third of the consumers populating the United States formulate their impressions and assumptions about a company based on how clear and attractive the office signage is. Still not convinced? Research as recent as summer 2018 indicates a positive correlation between employee satisfaction and their work engagement. Keeping employees happy and motivated is just as important if not more important than pleasing customers. Since your guests will likely interact with your team members first, it’s essential to keep everyone in the equation happy. In addition, a higher sense of purpose instilled in your staff members can mean a higher output and better quality in their work — a bonus for any company in any industry. How Do Office Wall Murals Impact Company Culture? Lately, the argument for creating a “company culture” and an energetic place to work seems to be pinned on the backs of millennials. While it’s true that over one-third of the workforce is comprised of this age group, the attention on the culture at the office isn’t present solely to make them comfortable or help them want to work. A handful of benefits and good factors radiate from vibrant, large-scale murals throughout the office. Consider the following advantages your company stands to gain. According to web marketer Sujan Patel, office employees emphasize the need for their work to have a purpose and show they’re making a difference. This ideology helps explain how and why workplace culture builds and molds brand identity. The values, goals and mission of a company are motivators for employees to perform their best. Unique murals for the walls of your office will contribute to the brand awareness you set for both employees and visitors — more on this later. Additionally, the blog manager for Kissmetrics believes company culture can also customize the guiding principles set within a company’s mission. By emphasizing these principles around the office through wall mural designs, you’ll help establish the qualifications you put in place to hire — and sometimes fire — members for your exceptional team of workers. Patel continues to cover the positive effects of company culture by discussing the talent and loyalty found within the office. Creating a strong sense of community encourages similar beliefs to be valued and acted upon between your employees and various leadership teams. An estimated 36.7 percent of employees are actively engaged and productive at work, making it necessary to invest in applicants who appreciate you and what your company represents. Corporate wall murals will help reinforce the best elements of your company culture to encourage long-term partnerships and successes, year after year. One final note is a testament to the appreciation and enthusiasm your company culture brings to your team. Simon Sinek has bluntly quipped, “Customers will never love a company until the employees love it first.” By instilling a positive and appreciative environment around your office daily, you ensure that your employees quickly become your company’s greatest advocates. Recruit through your employees’ social and professional networks, and you’ll find both trusted customers and potential coworkers. If you’re looking for ideas on how to represent your brand in unique designs for your interior wall murals, look through our online idea gallery for examples from a variety of businesses and industries. You’ll see how broad your large-scale picture can be, whether it’s lettering and typography, a scenic view, a branded logo or some ambient colors and patterns. We’ll customize designs to help you achieve maximum brand awareness throughout your office and workspace. You can take a handful of different directions and angles with your brand awareness designs. The three most common perspectives and paths include focusing on your audience, choosing your location and working toward an end-goal. Below, we’ll highlight how each area can complement your brand and provide you with top-tier results from customers and employees alike. One way to customize your office decorations is by pinpointing which audience you’re looking to connect with and inspire. Do you have employees who need the motivation to get through the workday? Are you struggling to create a company culture everyone can participate in? Have you been looking for ways to better connect with customers while they wait for their appointment or request service? Your audience has an immense power over the direction of your designs. The front lobby and reception area are some of the first elements your customers will interact with upon entering your office. Your visitors will also be walking down hallways as they navigate through the various offices and workrooms in your building. By targeting these areas, you’ll ensure customers get a firsthand look at your brand without fear of missing out or obliviously looking in the wrong direction. For employees, locate the areas in which you’re spending the most time as well as the areas that require the most attention and productivity. An open-floor office will benefit from multiple walls or office barriers sharing branded messages or company goals. A conference room can center the mindset of every employee and keep everyone on the same track as far as client negotiations and inner-company discussions go. 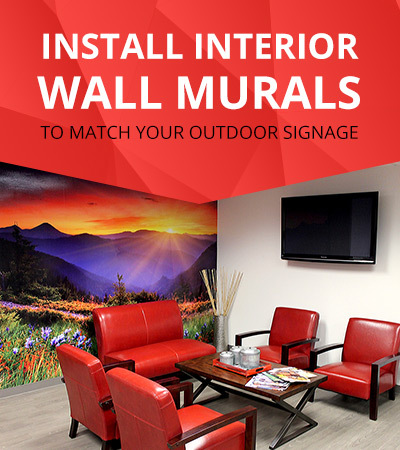 Much like identifying your corporate wall murals to match the expectations of your intended audience, you can decorate murals you know will be specific to areas around your office. For example, you might need an overarching design to pull together the slogans and branded logos represented in your lobby. Maybe your conference room is the only area without windows, and your clients and employees feel the energy draining when they walk in. By narrowing down particular rooms or areas of your office building, we’ll make sure we can customize a unique wall mural to transport your audience wherever will make them the happiest and most engaged. Another approach to adding interior wall murals to your office is to focus on a goal or objective for your work environment. Are you aiming for a clear welcoming view or looking to establish your branding for everyone to see? The lobby of your office is an excellent area for office decorations that promote your brand. Do you need to increase the productivity of your employees or inspire their commitment? Try adding a mural to individual work offices or in the open floor plan where workers spend a majority of their time. There are two more objectives or feelings you may want to pinpoint with a branded large-scale wall mural. Maybe you’ve previously decorated your reception area but are looking to promote your company’s mission statement, shining a spotlight on your company’s values for customers to feel a part of. If this is the case, locate a central wall that sits prominently in your building for a maximum effect. Finally, keeping employee morale up will not only contribute to the company culture but also encourage top-tier recruiting for your leadership team. To reach this goal, find a shared space — such as a break room or common discussion area — to generate a feel-good, positive atmosphere. At SpeedPro Imaging, we’re focused on providing your company, business or organization with premium-quality corporate wall murals that are unmatched in design and quality. While our murals are designed to be installed indoors, they’ve taken inspiration from the popular graffiti street art that decorates many cities and urban communities. Adding outdoor signage to your building is crucial for visibility and importance. After all, we previously reported that nearly half of Americans say they have failed to locate a business because of unclear outdoor signage. We encourage the colorful and vibrant street art and mural painting that still happens to give buildings an edge, but we also want to make sure your interior wall murals coordinate and match the branding you establish outside. Let’s look at some success stories of businesses using a combination of their outdoor appearance and their interior design to generate business and attract attention around their community. In Detroit, a vibrant blue mural was painted on the side of a cafe, featuring a black woman adorned with a large afro hairstyle. This painting caught the attention of bystanders, who were often seen taking selfies and photographs in front — but the appeal didn’t stop there. Owner Candice Meeks said that the cafe’s name was being Googled more rapidly and frequently than before while they fielded more and more phone calls about hosting parties and events. Another story comes from Tampa, at the residential Crescent Communities projects throughout the city. Two particular buildings — NOVEL’s Riverwalk and Crescent Westshore — have used their outer structure as an art canvas, creating murals and sculptures that quickly attract the eye. As marketing director Ben Watt said, curious eyes aren’t just observing from the outside — you’ll often see people swinging by for a quick selfie but being so intrigued by the hip-looking culture that they’ll ask for a tour of the community. Before you know it, they’re homeowners too, thanks to what he defines as increased awareness “from a fuzzy metric standpoint,” which helps set their brand apart from the rest. So what does all this mean regarding corporate wall murals used inside the office? The businesses mentioned above have mastered the ability to generate appeal and make positive first impressions with their outdoor setup. But being successful and not just attractive requires thorough branding inside and out. The cafe would not be as big a hit if the indoor design wasn’t as creative as the outside, nor would the community living be as fun and enjoyable. The inside can’t look dull in comparison to its outdoor installations. Wall mural designs are customizable to meet your business’s needs, helping you to emphasize your brand, connect with customers and inspire a company culture everyone feels a part of. Our nationwide network of studio centers is available for companies all throughout Canada and the United States, so don’t hesitate to rely on SpeedPro Imaging for any of your office decorations. When you reach out to our team, we’ll gladly help you choose the best designs for your brand and place them where they’ll have the biggest impact. Find a studio and design team to pair up with today, and get a firsthand look at the importance of wall murals and the various benefits your business will gain.